There is a moment in Lincoln when, after a long day and an awkward conversation with his wife, Abraham Lincoln (Day-Lewis) ambles into the family room of the White House to find his son Tad (McGrath) asleep on the floor in front of the fireplace. Lincoln carefully lowers himself onto the floor beside his son, with some considerable effort to avoid the pain he must be feeling. Like a well rehearsed play, his son recognizes the sound his father is making, rises atop his back and holds close to him. Lincoln arduously lifts himself from the floor with his son astride him and they begin the journey towards their rooms for the night. It’s a subtle event, in the face of the momentous occasions covered in the film, but it is an important one. In this sequence we get to peek into the soul of the man who changed the course of history in the United States. His soul and force of will kept a nation together through its weakest moment, his foresight helped to move it forward. In the course of events that follow, we get to see first hand how all of this happens. 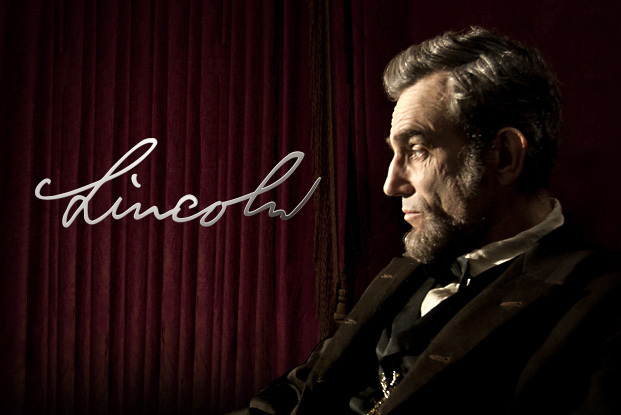 As an effort, Lincoln is filled with such detail of its subject that it overcomes the film’s lone weakness: the oversimplification of the counterpoints. Part of this is due to the opposing view to the Republicans of the story are, by and large, racist and often times small-minded people. There were other facets to the slavery economy that tied the country in several ways to its horrific past. It would have taken a six-hour film to break through the surface of these issues instead of the 150 minutes employed here. Still even with that hinderance, the task of the North is covered thoroughly here. In short, Lincoln and his allies, Seward (Strathairn), Blair (Holbrook), Bilbo (Spader) and Thaddeus Stevens (Tommy Lee Jones) are working to get passage of the 13th Amendment to the Constitution of the U.S. before the Civil War grinds to a painful close. They cannot wait until this time for myriad reasons, with the re-admittance of the Southern states being foremost among them. To see Lincoln explain this is a tense pleasure. His knack for storytelling works wonders in putting listeners at ease into accepting his move into a more serious territory. This process is played to perfection by Day-Lewis. Indeed every moment he is on the screen, we feel not like we are watching the man, and not an actor. Smartly, we are not watching a saint, but a deeply troubled man. His wife, Mary Todd (Field) is a fierce protector of her husband and children. They are a few short years removed from the death of their youngest child and neither has handled it well. Now, with their oldest son Robert (Gordon-Levitt), is pushing to join the Union army, and Lincoln is doing the best he can do to prevent it. When he is unable to do so, he still manages to give him a favorable position (Fortunate Son style). This is not enough for his wife, and the resulting fight is jarring in its demonstration of weakness on both of their parts. It’s almost Springer-esque in the sense of voyeurism one feels watching them. It feels like a sin to watch them work through such sadness so angrily and aggressively. Jones’ performance is firmly within his range. The lines of his unmoving face show more than most actors could ever dream of. Here he plays a Radical Republican looking for more than the 13th Amendment offers…by a long shot. His efforts are pushing the fringe Democrats away, and he must be reigned in to move forward. His insistence on seeing Negroes as equals comes from a deep, almost sacred place. It is an amazing journey seeing him move from myopic truth to a greater wisdom. Then to see the revelation of his heart of hearts is one of the most tender moments of the film. The rest of the portrayals of the film depend on where the character lies on the spectrum of slavery. Democrats are shown to be either lame ducks to the future (Republicanism), to cowards, to blowhards and worse. For every apparently contemplative Coffroth, there are two verbosely incompetent targets for Stevens, such as Wood and Pendleton. These are but small complaints, though, when compared to the power that Spielberg coaxes from the story. Very little of the significance is manufactured. Like a sculptor, he knows the beautiful object lies within the object. His job is to whittle away until it reveals itself. He is learning to get out-of-the-way of himself. The less he attempts cheap gimmicks (like the Red coat of Schindler’s List) or preaching (A.I., The Terminal), the more his obvious storytelling gifts shine through. His politics are well-known, but they need not dominate his work. Lincoln is nearly perfect because he resists these impulses. A final image before the end of the story brings it to the most chilling close. We see a powerful Lincoln, striding humbly from a post war planning meeting with his staff. He is heading towards his doom, but because of Spielberg’s incredible story telling power, we see a bookend to the scene described at the start of this review. Tad, watching a performance of Aladdin and the Wonderful Lamp at a different theater, learns about his father’s fate in between scenes when it is announced to the crowd. Gripping the railing, Tad cries out, in the midst of the exasperated crowd. The very next scene, his mother is led away from his father, who lies crumpled and frail on a couch too small for his frame. The pain he felt picking up his son is gone. The pain his son will feel missing that strong presence has just begun. That is the enduring vision of Lincoln for me.